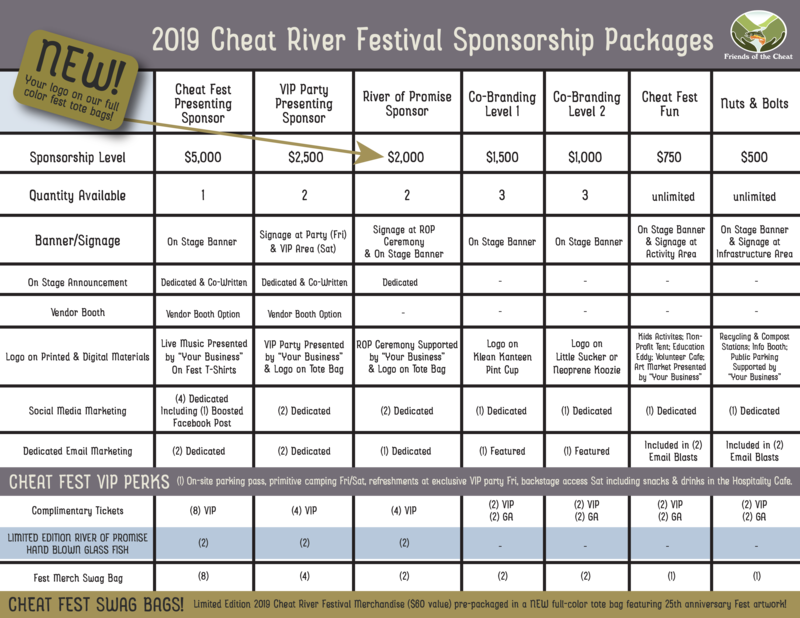 Did you know that Cheat Fest is the primary annual fundraiser that supports the work of the environmental non-profit group Friends of the Cheat (FOC)? FOC has worked to restore, protect and promote the health of the Cheat River Watershed for over two decades. From monitoring water quality and remediating the polluted run-off from abandoned coal mines to supporting river access and offering environmental education, their work has broadly and deeply impacted the surrounding community and habitat. Cheat Fest serves to both celebrate this work, and to provide financial support and stability to an organization loved by its community. Sponsoring partners help assure a successful festival experience for FOC and for the community of river lovers who come out every year. Learn more about how you or your business can support this work through a sponsoring partnership below. Learn more about the work of Friends of the Cheat here.